The Burj Al Arab is a futuristic architectural marvel towering over the gulf. 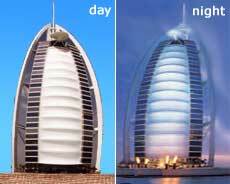 The Burj Al Arab is shaped like a billowing spinnaker sail (see photo). 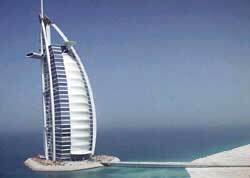 The Burj Al Arab (means "The Arabian Tower" in Arabic) is built on a tiny man-made sea island, a mere football kick from the Dubai mainland. A short causeway (see photo) links the hotel to the Dubai mainland. The hotel is significantly taller than it appears to the eye. It rises 332 meters (1053 feet), making it one of the world's highest buildings. 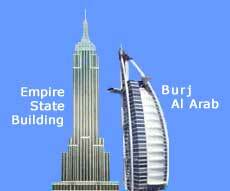 To grasp the Burj Al Arab's height, imagine New York's 102-floor Empire State Building standing next to the the Burj Al Arab, which is just 16% shorter. The Burj Al Arab's streamlined shape and its double floor design help create the optical illusion that it's smaller than it really is. 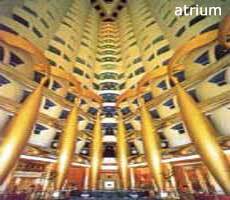 The Burj Al Arab's atrium is the world's tallest, measuring 180 meters (600 feet) high. The interior cavity rises from the lobby level to the hotel's upper floors. The Teflon-coated hotel is brilliant white during a sunny day, but takes on an entirely different look at night. Computer programmed spotlights create a changing tableau of colors on the white facade. The building is an all-suite hotel. There are 202 double-floor suites. Each is sumptuously decorated and equipped with high-tech devices. The Burj Al Arab suite windows stretch floor to ceiling, offering grand sea and land views. Each suite has its own private butler. Double occupancy rates start at about $1,000 per night for one bedroom suites. The two sprawling Royal Suites go for more than $5,000 a night. Diners in the Al Manhara seafood restaurant view teeming Gulf ocean life in a hangar-sized aquarium tank through a long curving wall of sizable picture windows. You can take a short simulated submarine ride from the Burj Al Arab hotel lobby to reach the restaurant. A helipad dramatically juts out from one of the upper Burj Al Arab's floors. Helicopters ferry guests to and from Dubai's modern international airport. "Budget-minded" guests take the hotel's Silver Cloud Rolls Royce limousines. You get an up close, ground-to-top view of the Burj Al Arab from outside its main gate. Non-hotel guests can see the interior by booking a tour or dining table.